It's turning into quite the month for online music-making tools. First we had Errozero's Acid Machine, then Madeon brought us his Adventure Machine, and now we have the HTML 5 Drum Machine. Powered, as you might expect, by HTML 5, this comes with five kits and a 16-step sequencer. Usefully, patterns you create and save (there are two slots) can be exported as WAV files, so this needn't be just a time passer. 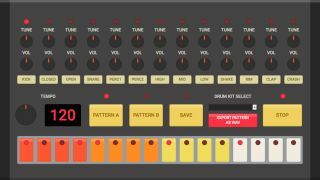 Give it a go on the HTML 5 Drum Machine website.